Today, City inspectors arrived unannounced to the Ming Sun Benevolent Association building and performed an inspection. The building, containing affordable housing, the artist collective Instant Coffee, and artist studio spaces for low-income Chinese seniors at 439 Powell has been under ongoing threat of demolition. The threat continues despite the fact that “several independent structural reports stated that the Ming Sun Building is structurally sound,” according to activists who have been fighting to save the site. Several people who have been working to save the building had arrived early to perform repairs on the building, but were surprised by the arrival of City staff, sparking concerns that the building would be demolished immediately. The concerns were amplified when at least a dozen vehicles from Vancouver Fire & Rescue Services arrived on the scene with lights flashing. A coalition of citizens, called “Friends of 439,” has formed to preserve the building. This morning about a dozen concerned supporters of the building converged at 439 Powell to keep watch over the property. 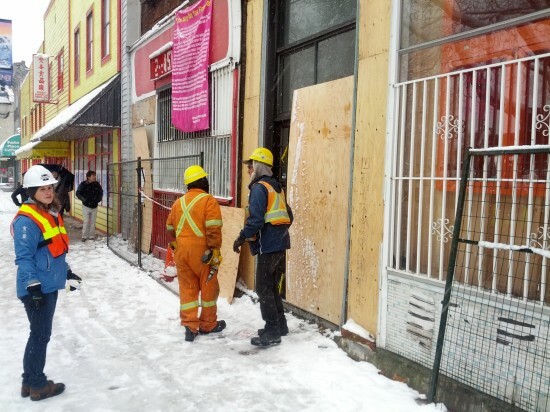 Early last week, Chanel Ly wrote an article for The Mainlander entitled “The Displacement of Chinese Seniors at 439 Powell Street.” She detailed its unfolding story, reporting the city’s claim that the building is unstable and in need of demolition. 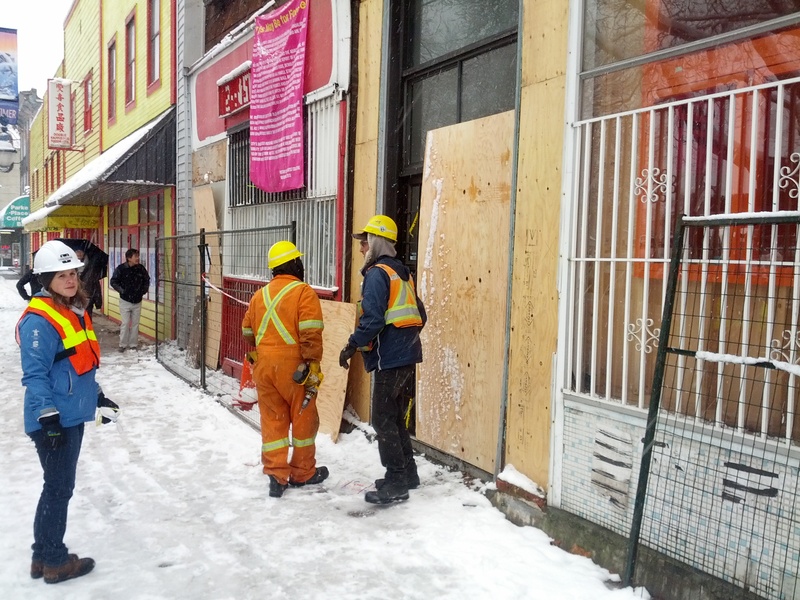 On December 10th, the City of Vancouver issued a release saying they would be boarding up the building due to “water flowing from the sprinkler pipes and six to eight inches of water on the main and second floors.” Many, however, criticized the fact that the city did not consult the owners of the building about its plans, and pointed out that the city seems overly eager to displace low-income seniors in light of similar developments in the area. Posted in Downtown Eastside, Gentrification, Housing, News. Bookmark the permalink. the only thing for sure, that is facing “imminent collapse”, is the credibility of city staff! We counted 7 fire trucks, one fire command centre, 3 police cars and a whole herd of city employees! Good darn thing there wasn’t a fire elsewhere in the city… uh wait… there was a fire… someone’s pants is on fire at Silly Hall!